Northampton School students on the steps of Montgomery House, 1926. 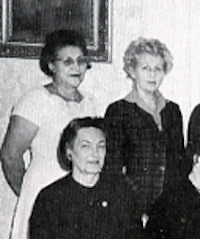 Jean Bigelow is in the 3rd row, third from right. (Please click images to enlarge. 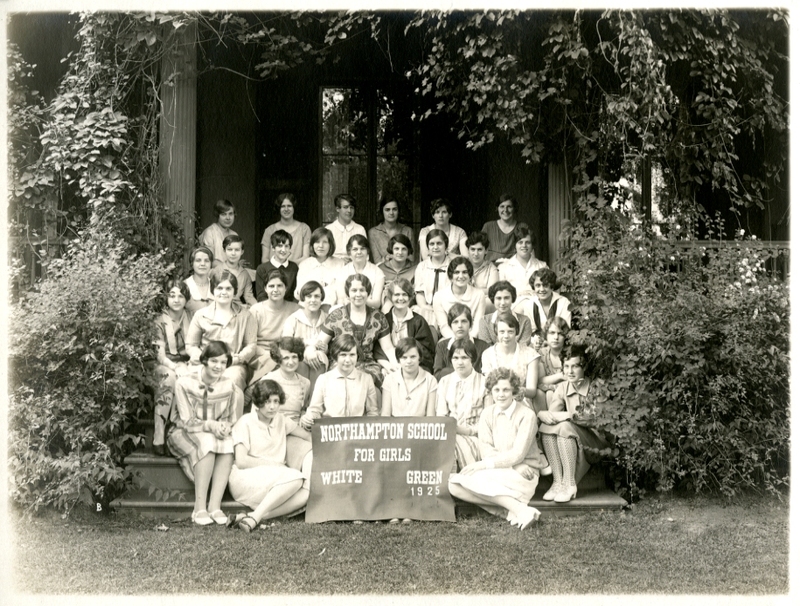 Recently the Archives acquired a photo album kept by Jean M. Bigelow, who attended Northampton School for Girls in 1925-26. Since Northampton School had just opened a year earlier, in 1924, the contents of the album represent some of the earliest images we have. 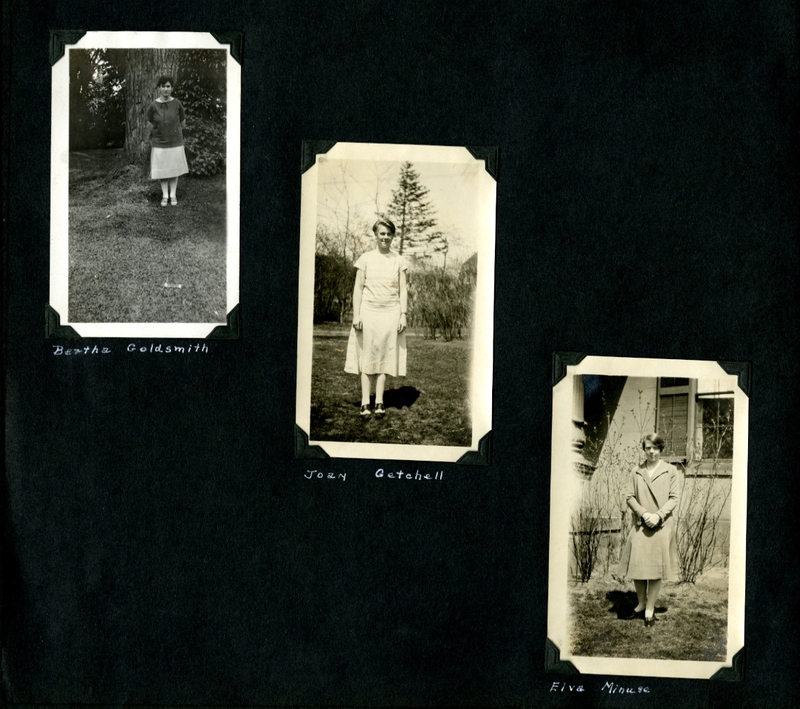 We don’t know much about Jean Bigelow — in fact, her identification in the photograph above is based on an ambiguous caption on another copy of this photo given us by Elva Minuse, class of 1927 (that’s Elva in the second row, second from right), and comparison with uncaptioned family photos elsewhere in Jean’s album. Beyond her academic transcript, she left no paper trail in our alumnae records. According to Social Security records, she was born in 1907 and died, aged 78, in 1986. She attended Vassar College, class of 1930, and lived in Worcester, Mass. Some of Jean’s friends. Elva Minuse is at the bottom. And that’s about all we know. But the photos capture Northampton School for Girls at its very beginning, so this is a significant addition to the Archives. 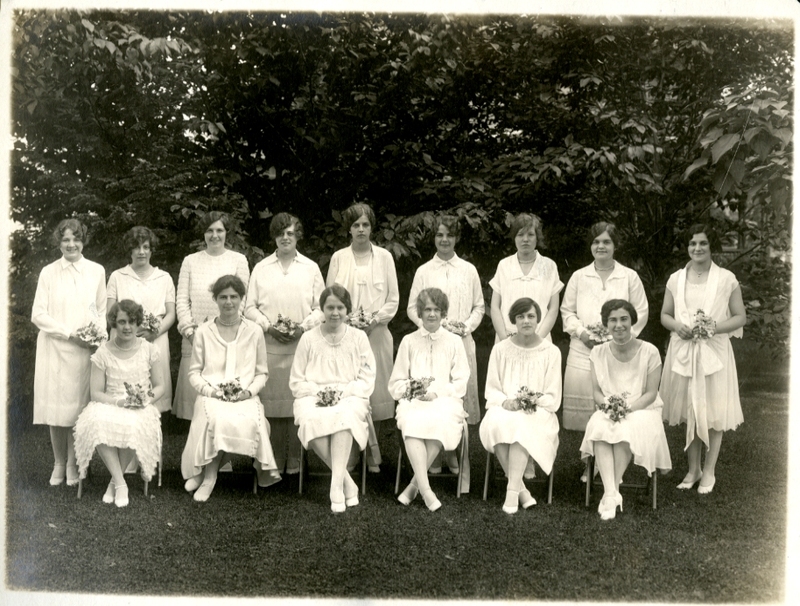 Commencement, 1926. Jean is in the back row, center. June — the seniors have graduated, the underclassmen have finished assessments (which are what we at kinder-gentler Williston used to call “exams”), and a lazy green quiet has settled onto the campus. Our parting shot to our returning students: “Goodbye, and don’t forget your summer reading!” It has been so for nearly a century. 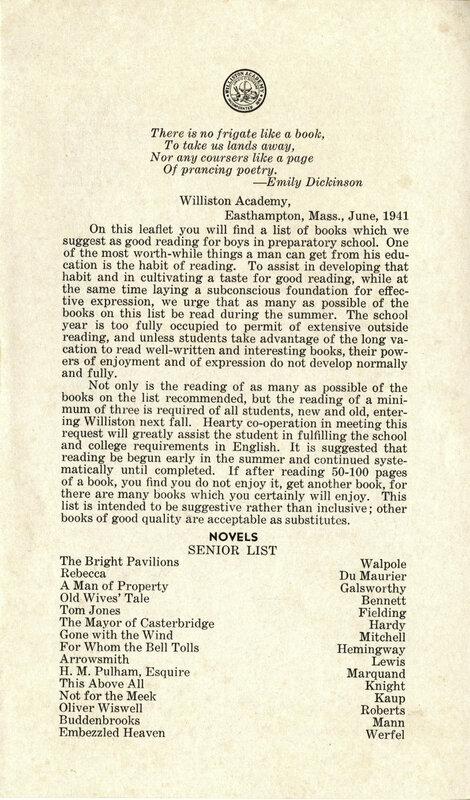 A summer reading requirement at Williston appears to date from the 1920s. No syllabi have surfaced from that early date. However, we have a list from 1941, which is worth reproducing in its entirety. (Please click images to enlarge). The truth, looking back now in the mirror of time, now, is that most of the teachers seem heroic in their own ways – all hard working women, very conscientious, and kind. In current culture, the general kindness of our classrooms seems a profound blessing. — Holly Alderman. With a comforting presence, Dagmar Abkarian ruled the pristine two-room Northampton School for Girls “infirmary,” located on the upper floor of Montgomery House. During my tenure, 1959-1962, she was a formidable presence, dark, round and with an unusual lumbering gait which seemed to separate her legs when she walked. She wore an immaculate white uniform, nurse’s coif, sensible white shoes, and a name badge. She was unlike any other teacher or faculty member at the school. Her coloring was like mine. It separated her and me from nearly all the other faculty, staff members and students who were mostly light eyed blonds and fair skinned. She was also a bit garrulous and although a mature woman, rather girlish at the same time. The waning days of summer: faculty are preparing for meetings and fall classes while students are finishing their shopping and summer reading — or in a few instances, starting it. School opens in less than two weeks, with all the joy, angst, and tradition associated with the event. 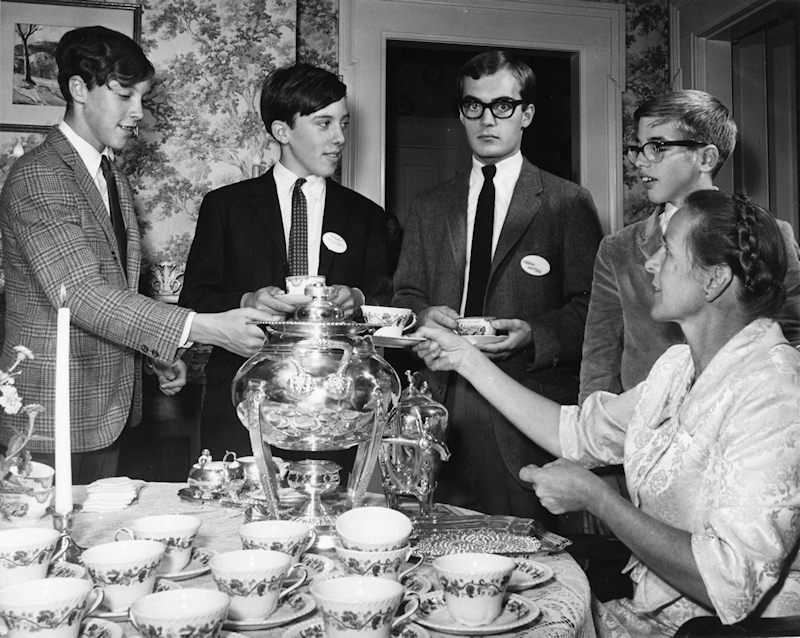 Once upon a time the tradition included a tea for new students, hosted by the Headmaster’s spouse and a phalanx of faculty wives. 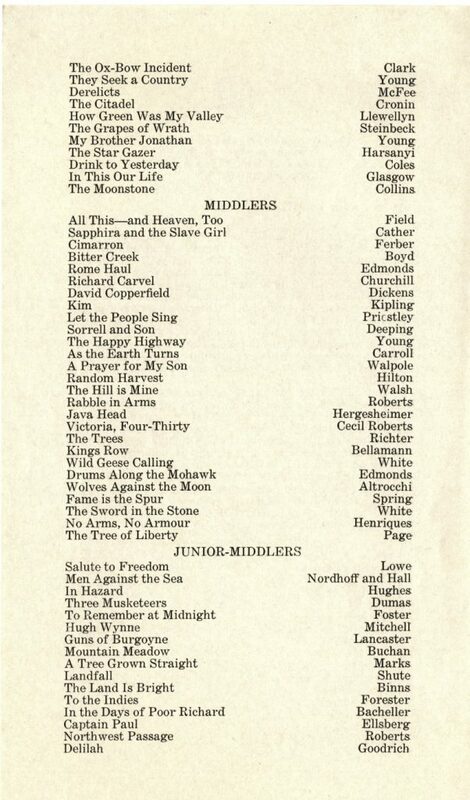 In 1966, a well-scrubbed and tightly necktied “newboy” myself (yes, it was one word then), I was present at this event. A woman of extraordinary warmth and empathy, Mrs. Stevens really did help to take the edge off of the noisy and sometimes impersonal first week of school. On the other hand, many of her guests had never tasted tea, and when offered cream or lemon, took both. Having lived in England the previous year, I knew better, but after 49 years I’ve never learned to like the stuff. Easthampton, Ms. April 20 1854 . P.M.